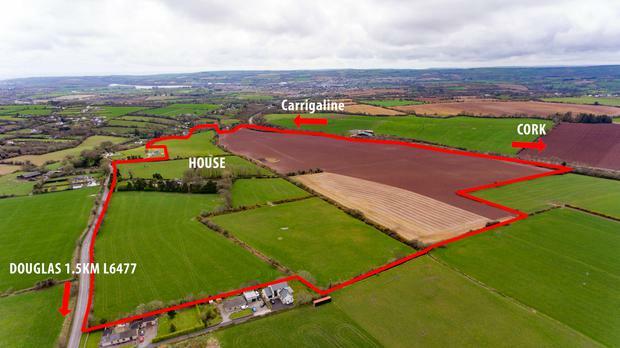 It is difficult to compare the price of land sold at auction in the first six months of 2018 with the same period of 2017, given the headline sale of 101ac of farmland in Cork city that made development land prices when it went for €5.8m or 58,000/ac at auction in June. The results, however, show a divided farming nation, with boom and bloom in Munster and south Leinster while there is stagnation and decline in the west, and to a certain extent in north Leinster. It is important to note that this survey is purely concerned with public auction — the private treaty market is not taken into account. Munster has had a bumper year so far with the average per acre price rising by 25.7pc from €10,304/ac in early 2017 to €12,880/ac in the first six months just gone. The amount of land sold in the province declined by 7.5pc and the amount of money paid for land went up by 13.4pc. The Munster figures are somewhat skewed by the sale in Cork of a 101ac farm at Douglas on the outskirts of the city, within the new city boundary. A figure of €5.8m or €58,000/ac was paid for the farm at auction in June. However, even excluding that property from calculations the Munster figures still show an upward trend. Fourteen auctions in the province in the first six months of 2018 saw 577ac change hands, realising a total of €7,426,800 in revenue and a per acre price of €12,880 — marking almost a 26pc increase on the average price paid in the first six months of 2017. South Leinster continues to be a success story when it comes to land sales. The amount of land sold under the hammer in early 2017 increased by 5pc on the same time last year, while the amount of money generated by auction sales showed a leap of 25pc to €14.58m. The average per acre price stands at €15,041, an increase of 19pc on the €12,560 paid in the first six months of last year. North Leinster has had a very disappointing start to the year, with the amount of land sold under the hammer down by 11pc, while the amount of money generated at auction is down 30pc. The average per acre price for land declined from €11,747 in the same period last year to €9,216 in the first six months of this year, a drop of 21pc. Connacht/Ulster has had a very poor first half in 2018, with auction sales all but collapsing. The amount of land sold under the hammer declined by 64pc, while the amount of money generated by land auctions went down by 70pc. The average per acre price for land fell from €8,211 in 2017 to €6,900 this year. The national result is also somewhat skewed by the sale of a 101ac Cork city farm. Some would be of the view that while the farm in question is currently an active tillage and grass holding, it was bought for the hope value. However, even with this farm excluded from the national figures the increase in the price per acre at auction stands at €12,021. This marks an increase of 8pc on last year.